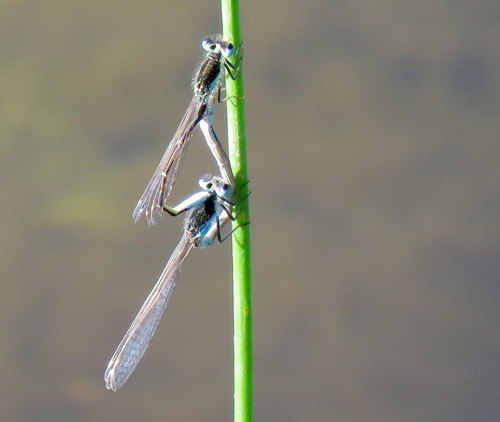 Mating pair of Small Spreadwings. 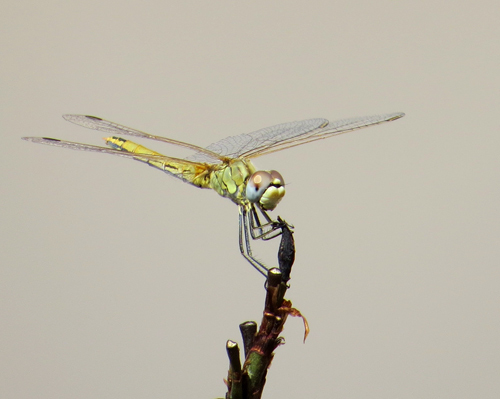 Male at top of picture. 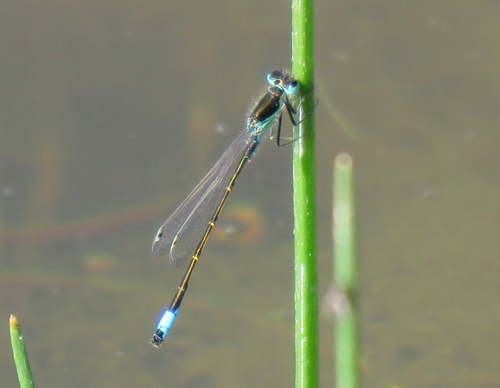 Note that this sub-species has bicoloured pterostigmae. 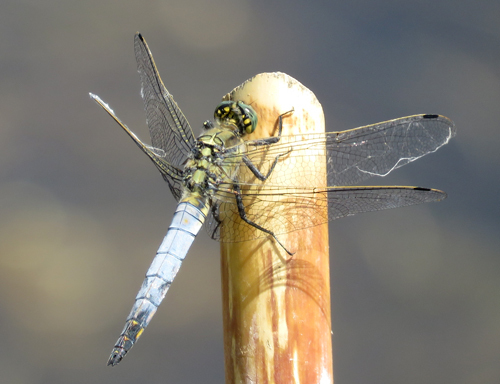 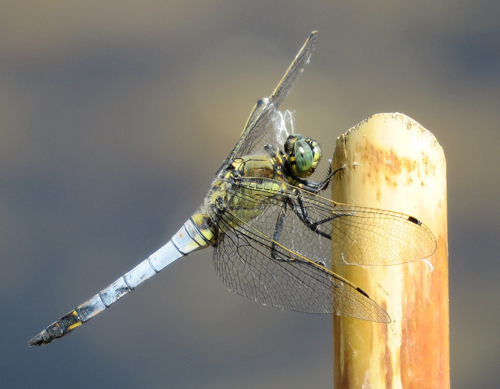 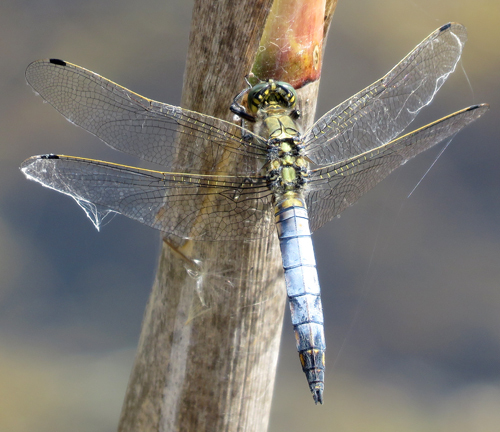 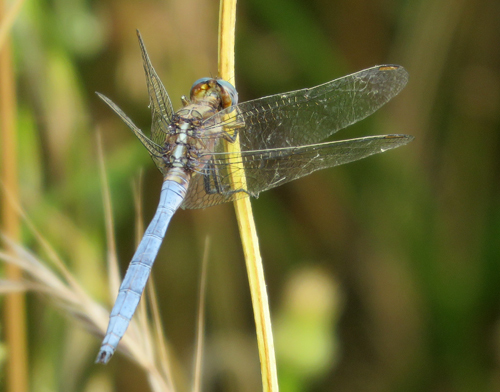 A pterostigma is a cell in the outer wing of an insect that is thickened or coloured and so stands out from other cells - particularly notable in many dragonfly species. 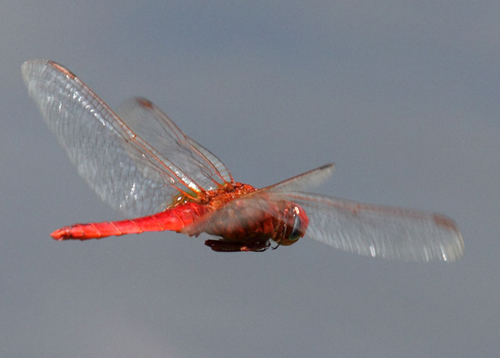 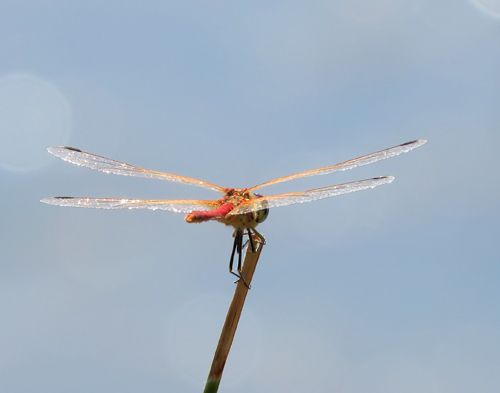 They assist in gliding flight by controlling wing vibrations that would slow the speed of the insect. 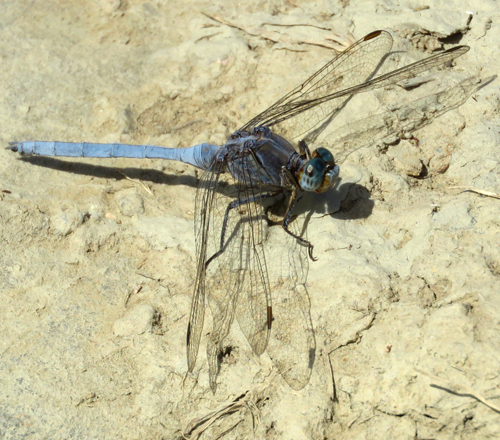 Hibernating adults of this species characteristically have blue eyes, as here. 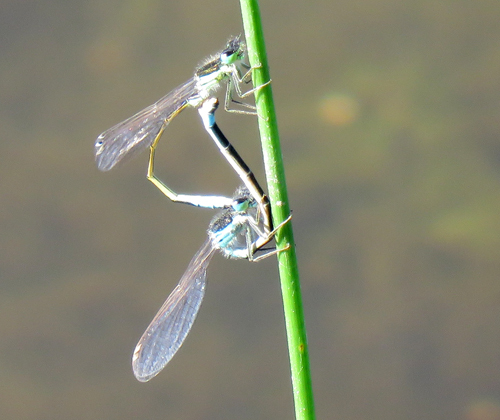 Female egg-laying (ovipositing). 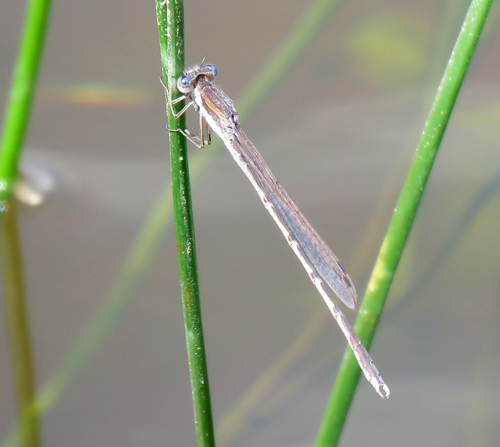 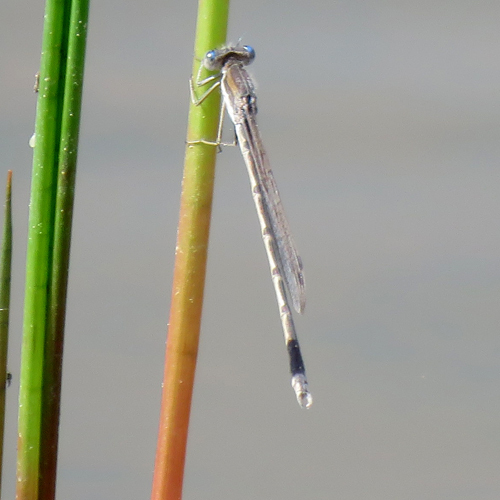 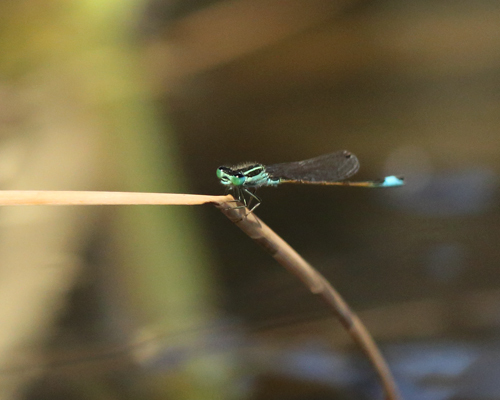 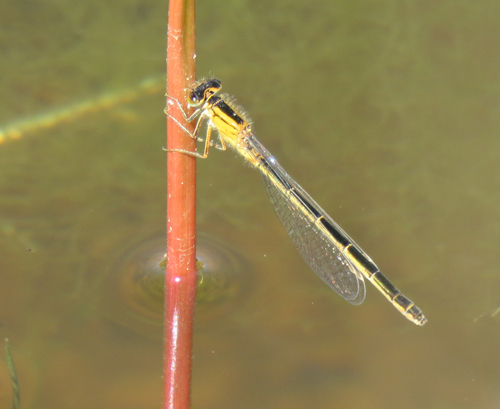 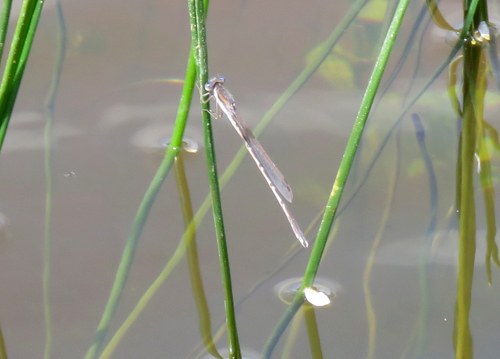 She will lay her eggs in the aquatic plant's stem and the resultant larvae will live in the pond until ready to hatch into an adult damselfy. 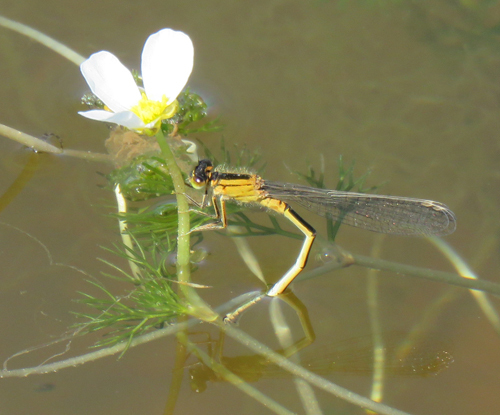 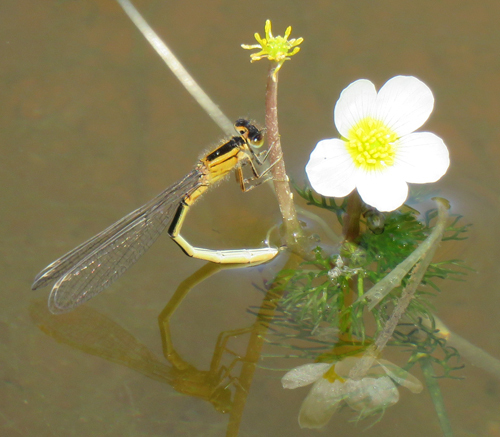 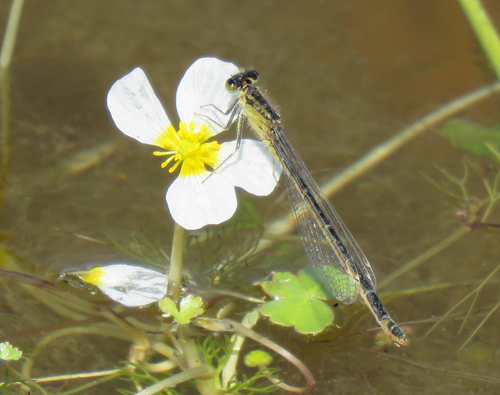 Egg-laying while clinging to Stream Water-Crowfoot plant. 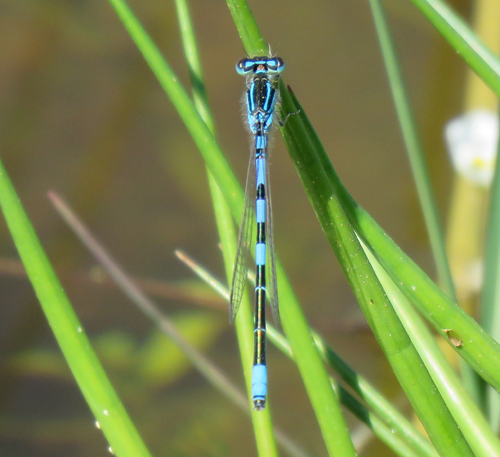 Male. 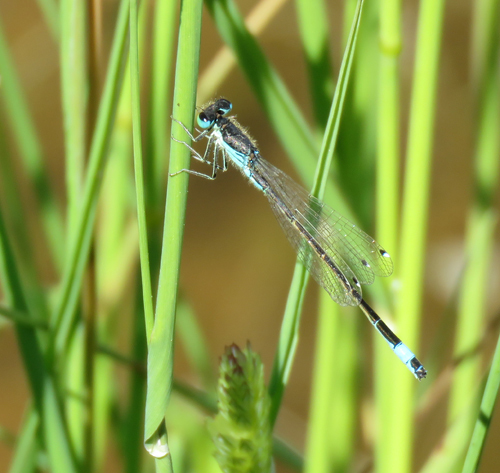 This species is found throughiut Portugal and is one of the most widespread Damselflies found across Europe to Eastern Asia. 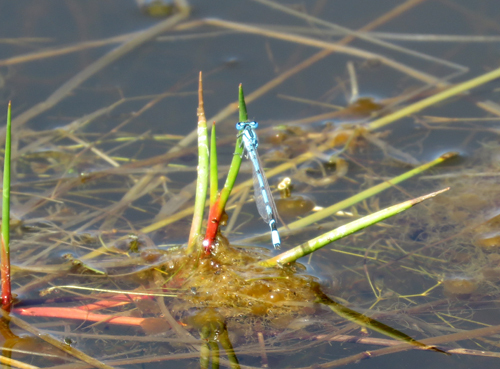 Females can be various colours. 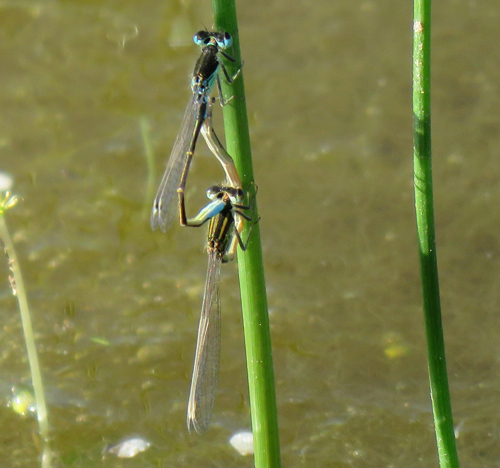 Iberian Bluetails mating. 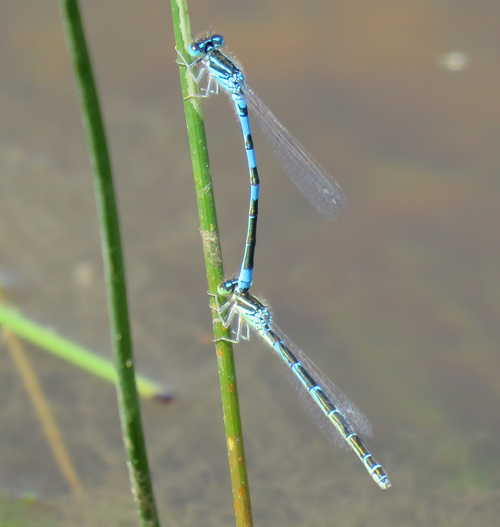 The upper damselfy is the male (blue) and the female is below. 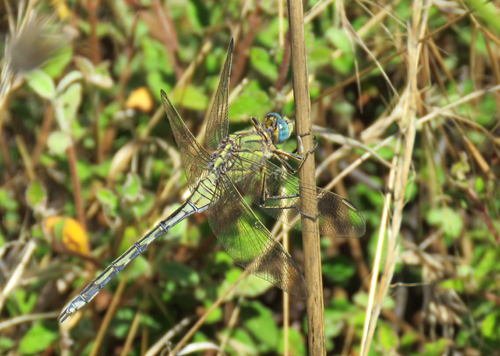 Male Iberian bluetail. 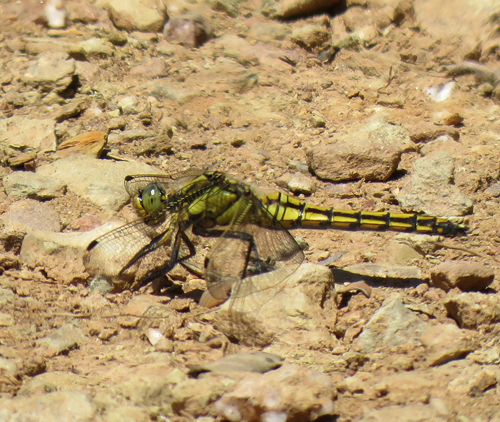 This species is found throughout Portugal. 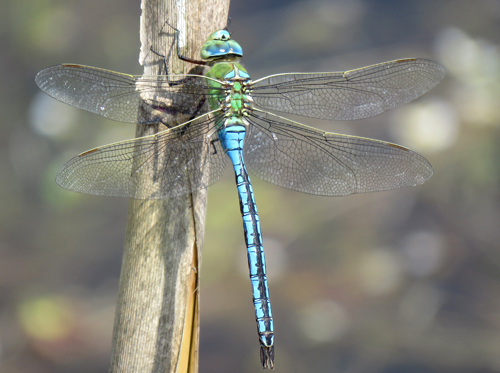 Male. 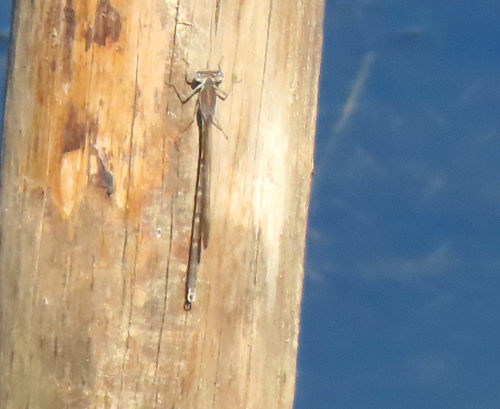 This species is quite small - only 26-31mm in length. 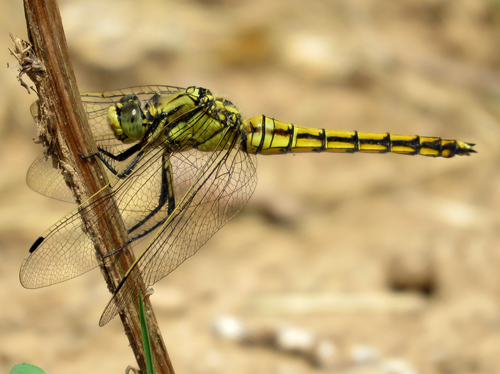 Male. 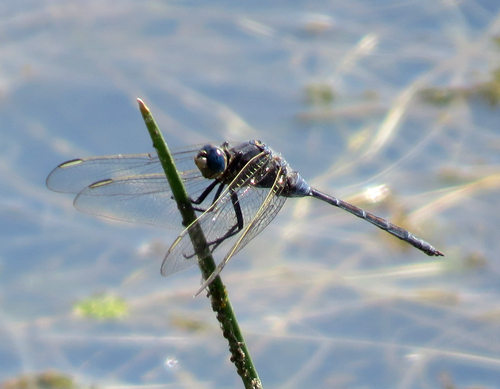 The Blue Emperor is Europe's largest Dragonfly. 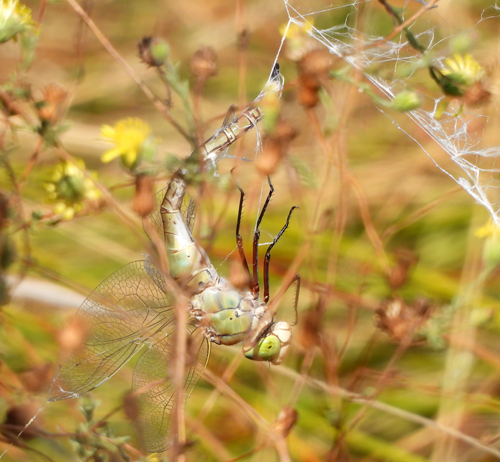 Female Blue Emperor caught in web of Banded Garden Spider. 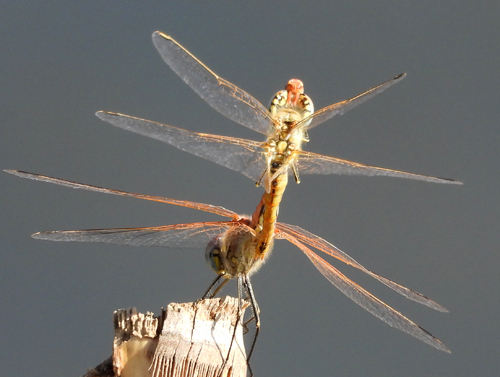 Mating pair of Lesser Emperors. 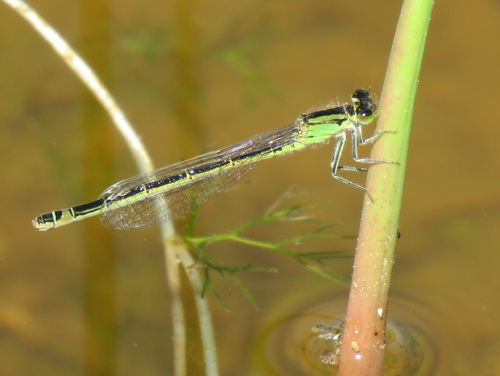 Female. 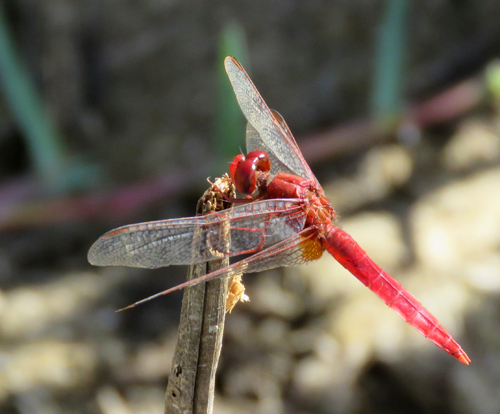 This species is found throughout Portugal. 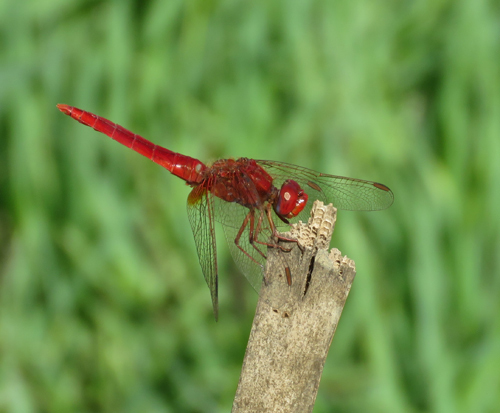 Male Broad Scarlet. 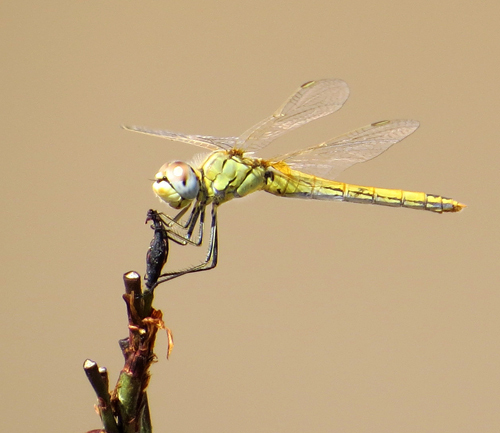 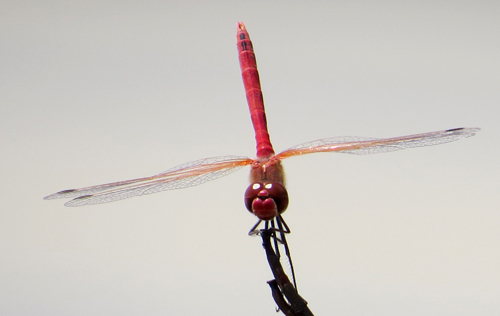 Note the breadth of the abdomen which gives this dragonfly its name. 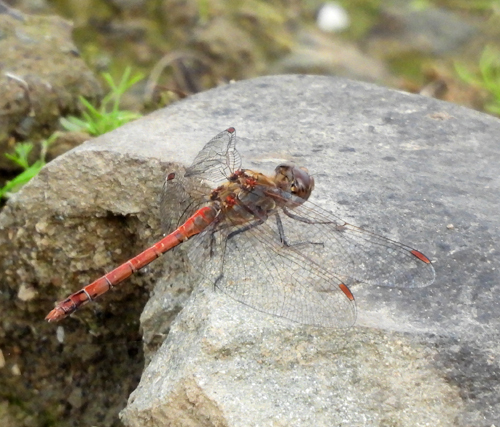 Note red legs which distinguish this male Broad Scarlet from a Redveined Darter. 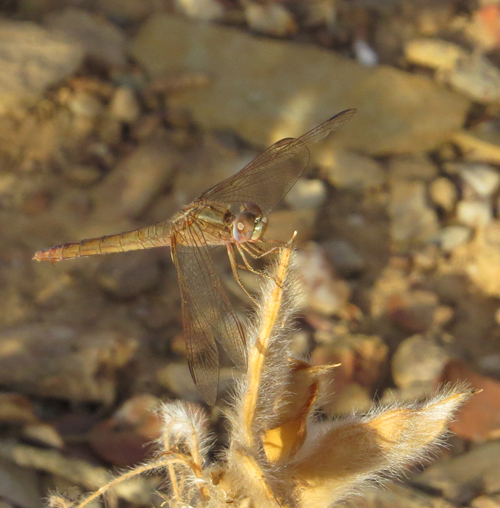 Female. 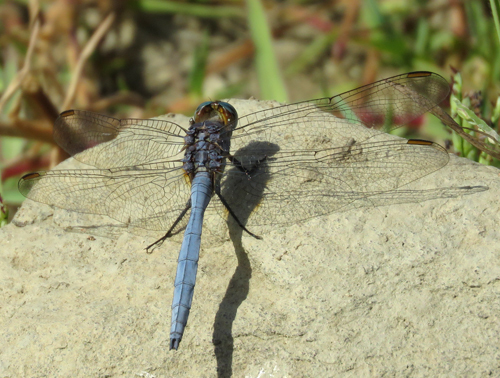 Note white dorsal stripe on thorax. 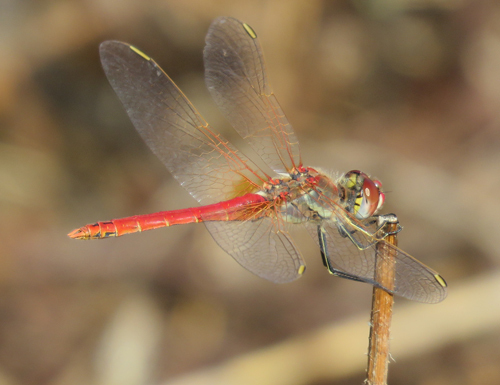 Note the marked red basal suffusion to the wings of this male Broad Scarlet. 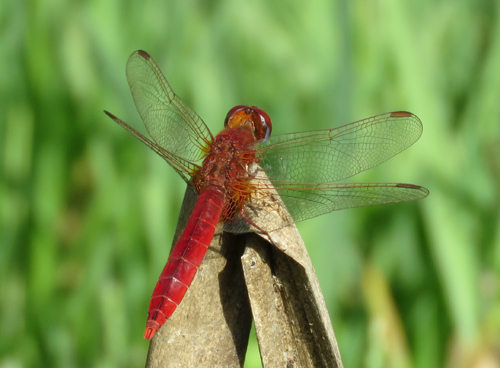 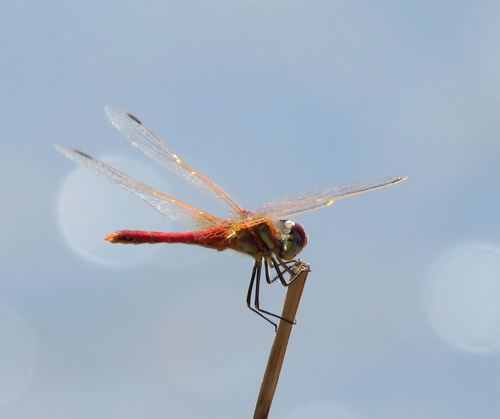 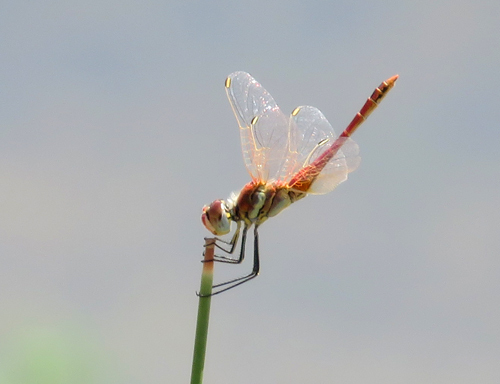 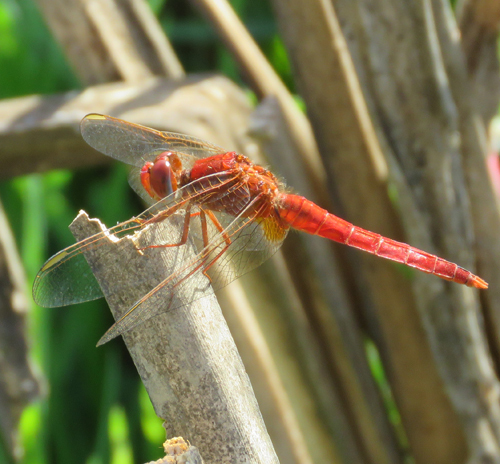 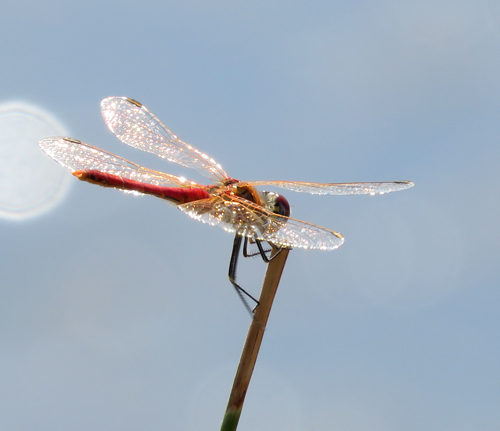 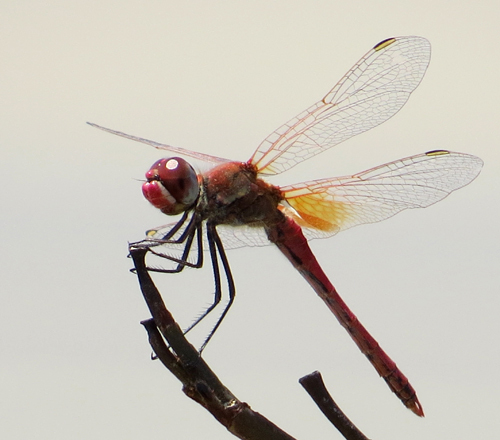 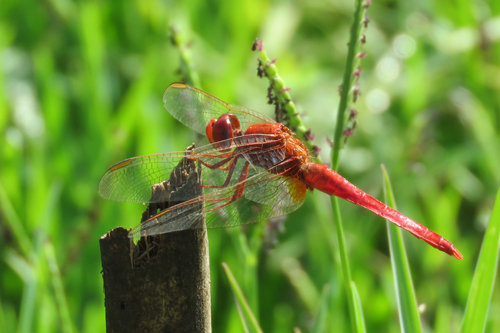 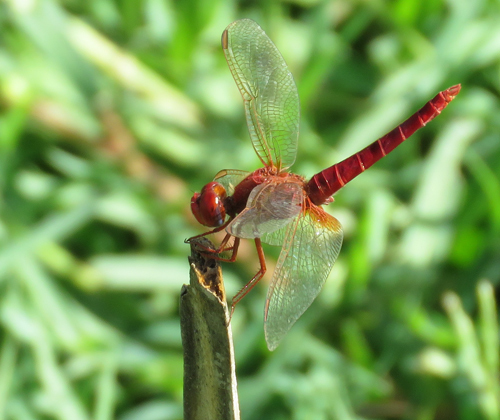 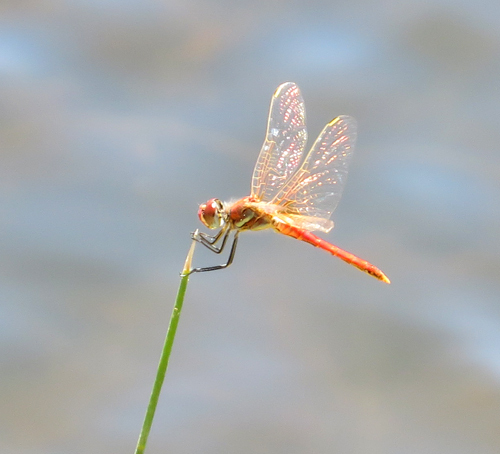 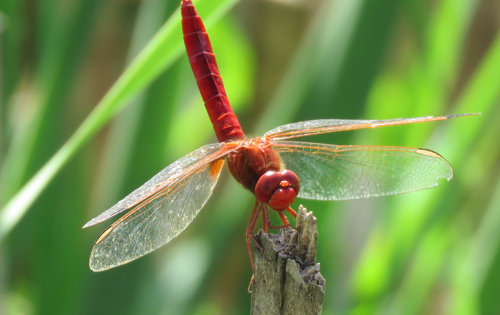 The Broad Scarlet (36-45mm long) is a little larger than a Redveined Darter (33-40mm long). 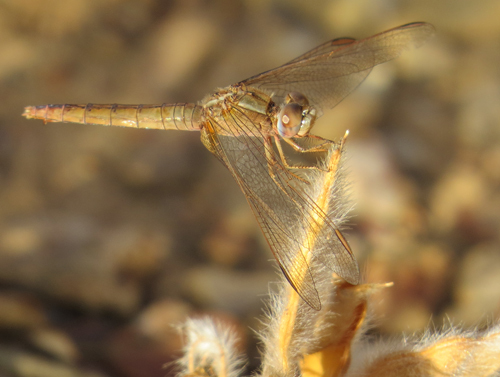 Female. 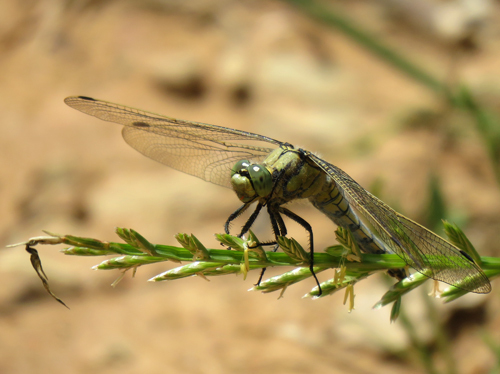 This species has expanded its range Northwards from Africa into Southern Europe.They also occur in West Asia. 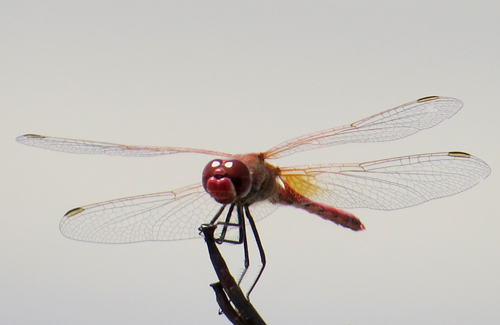 Male Broad Scarlet flying. 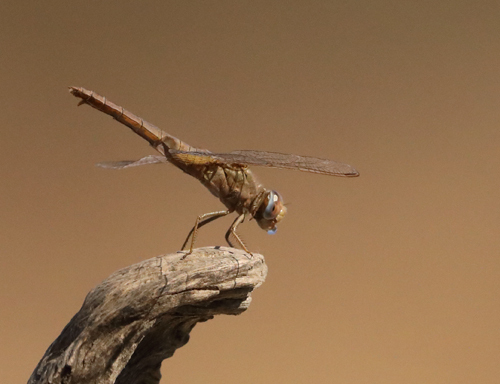 Photographed in South Africa. 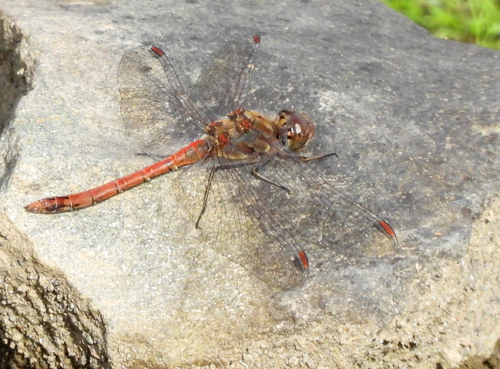 Female Broad Scarlet egg-laying. 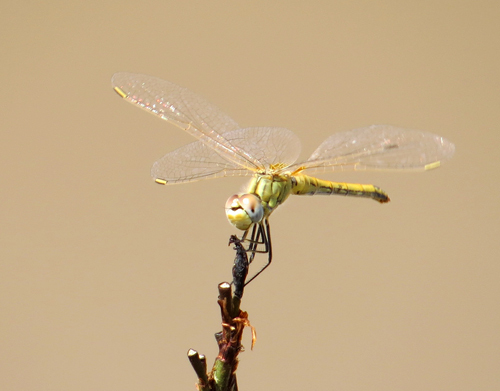 Photographed in South Africa. 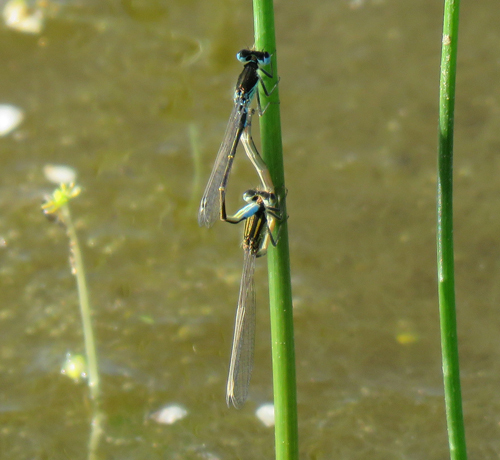 Female or Teneral male. 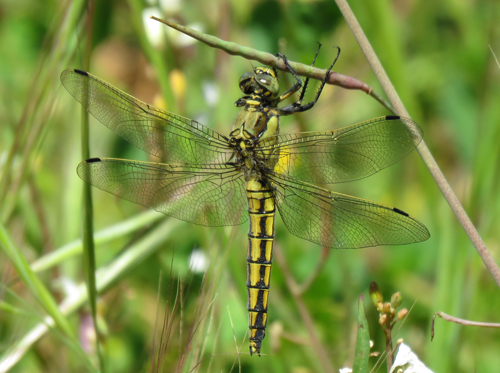 A Teneral is a newly emerged adult dragonfly that is soft and shiny and lacks the full colouration of a mature adult. 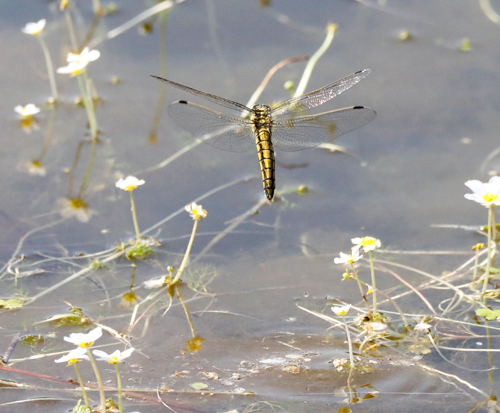 Female hovering above Windmill Pond. 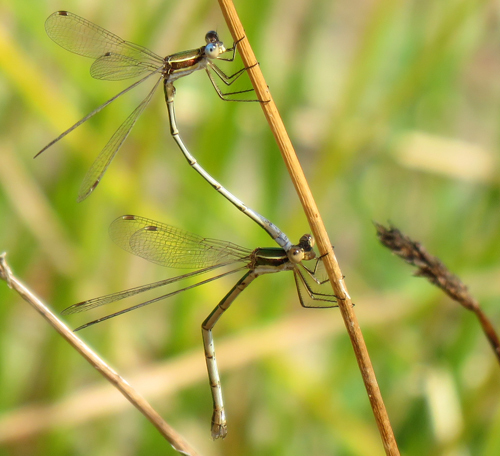 Female or Teneral male. 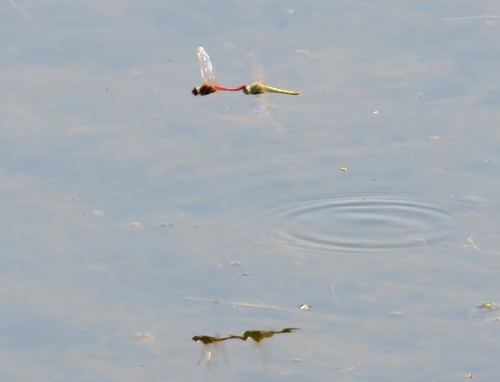 Most likely a Female. 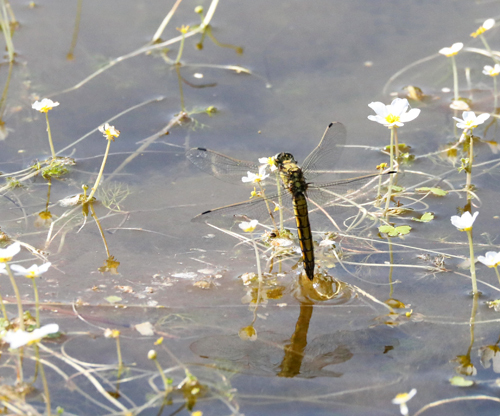 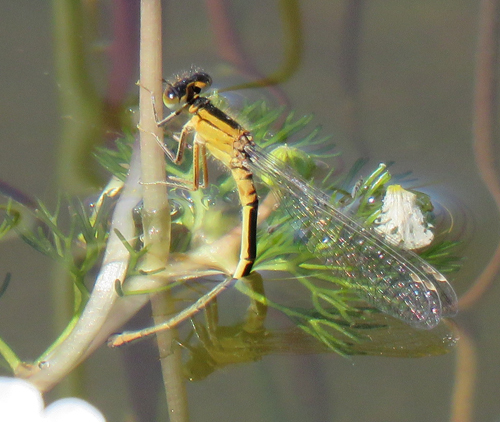 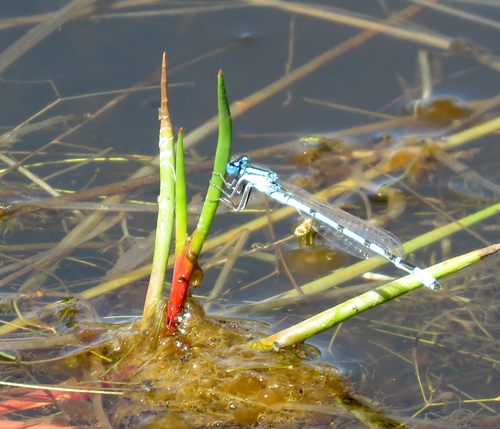 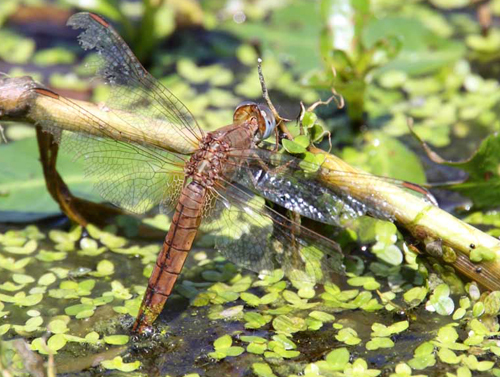 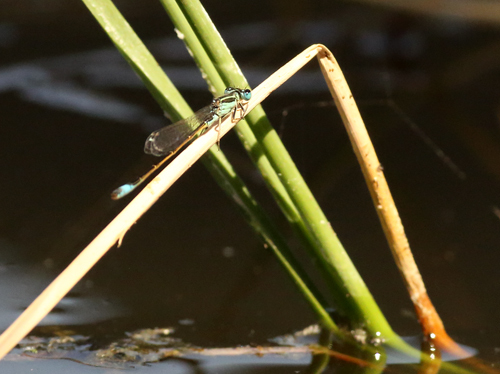 Female egg-laying (ovipositing) in Windmill Pond. 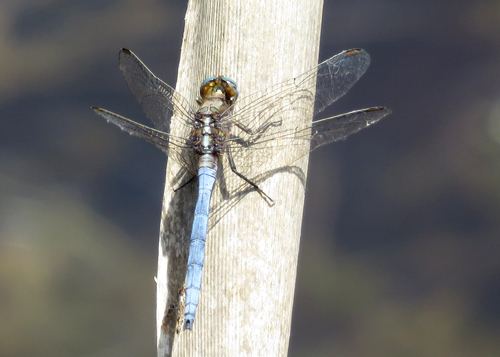 Male. 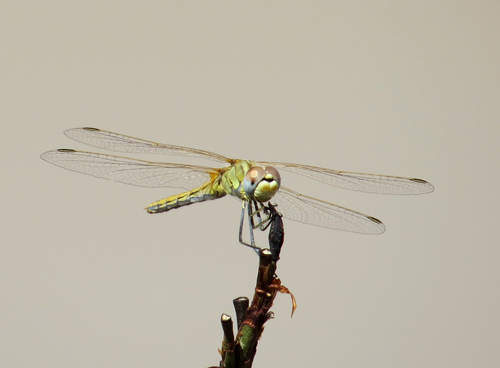 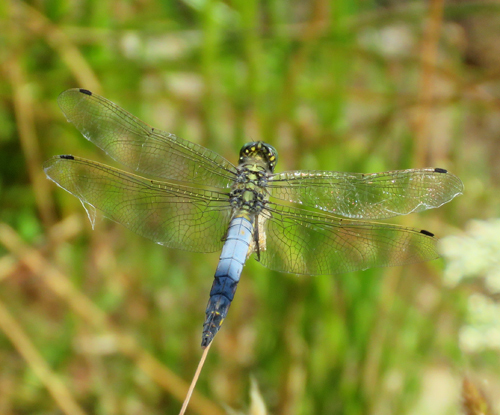 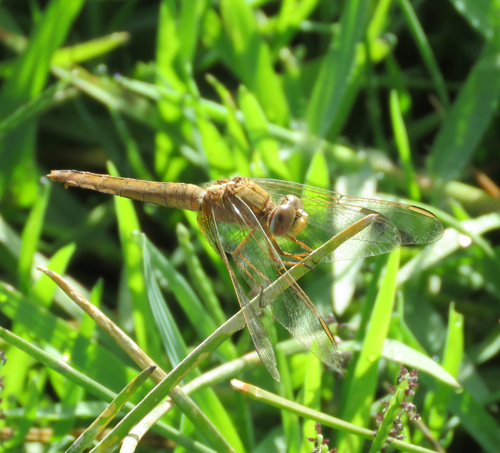 Note the small yellowish patch at base of hindwing which distinguishes this dragonfly from similar species. 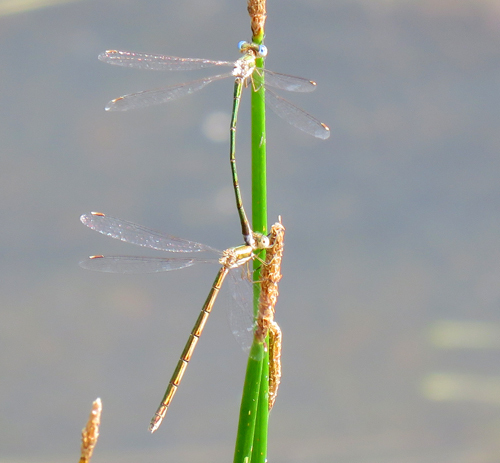 Note the characteristic slender and waisted abdomen near its base. 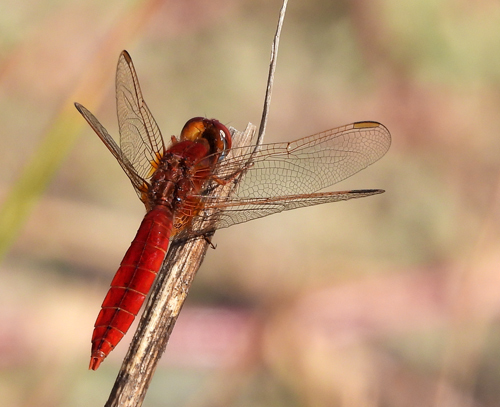 This species is widespread in Northwest Africa and across the Mediterranean basin from Portugal to Turkey. 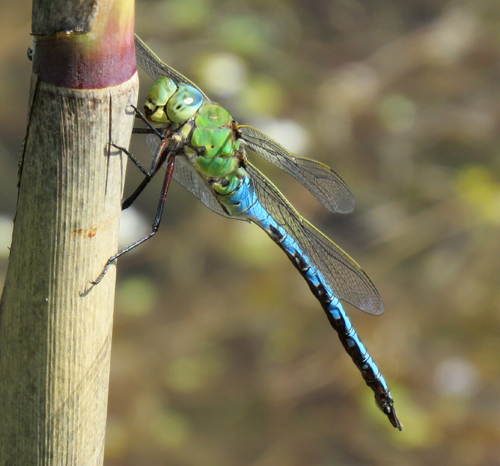 Male. 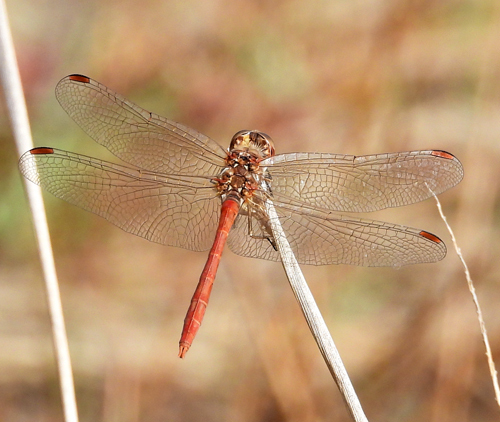 The Long Skimmer is a mainly African species, that also occurs in Iberia, especially in the South, and parts of Italy. 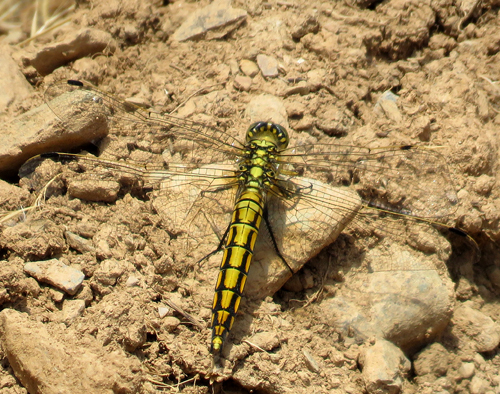 It is quite large: 51-67mm in length. 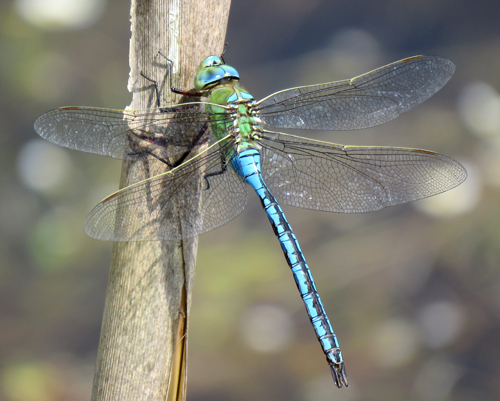 Male. 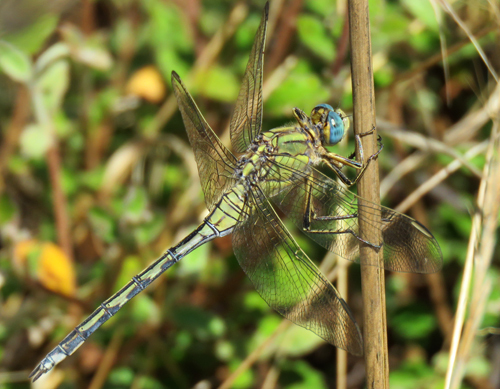 This species is classed as "Potentially Threatened" by the IUCN (International Union for Conservation of Nature) in its Red Data List. 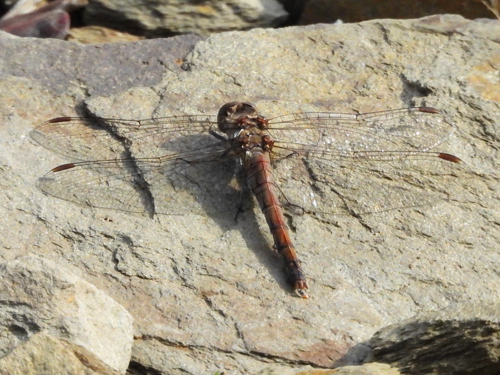 This species was first discovered in Iberia in 1980. 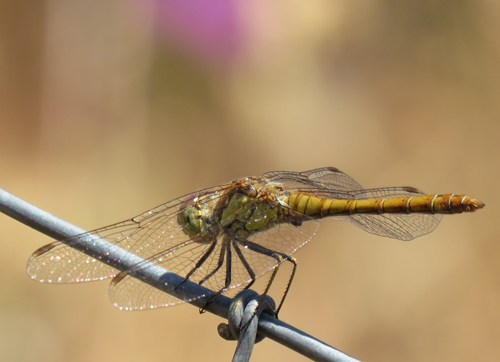 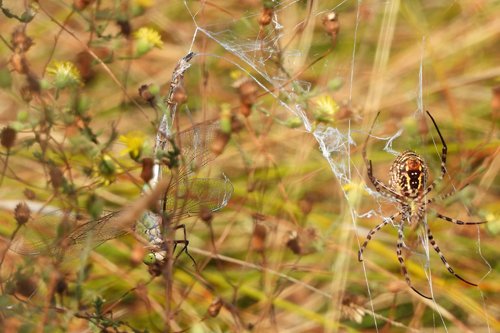 It is not common here and mostly confined to Southern Portugal. 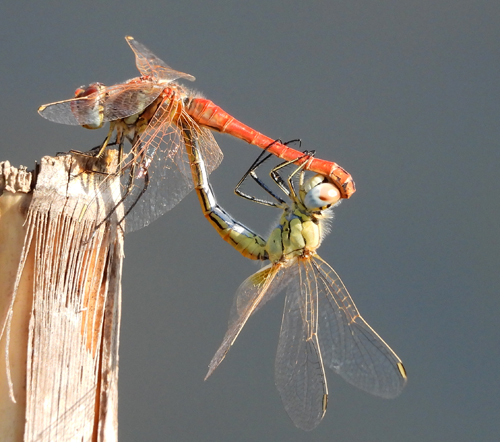 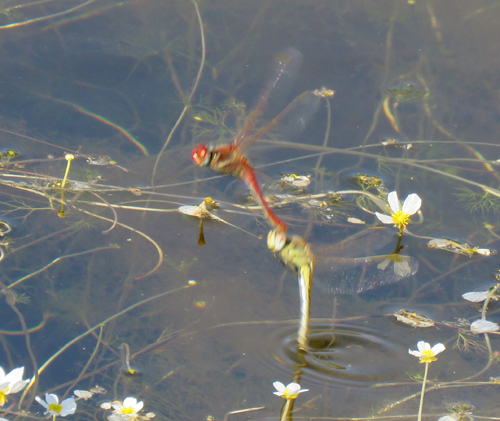 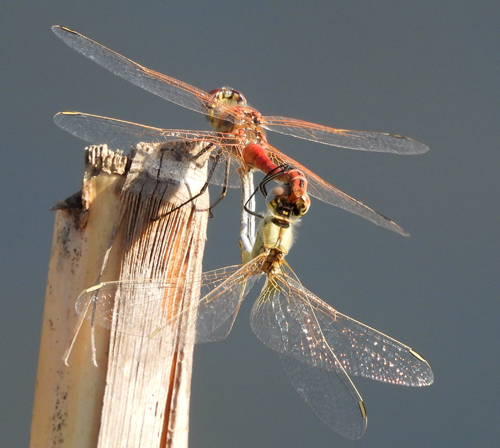 Mating pair of Redveined Darters. 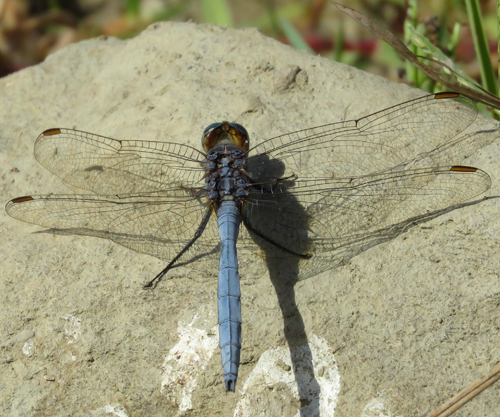 Female. 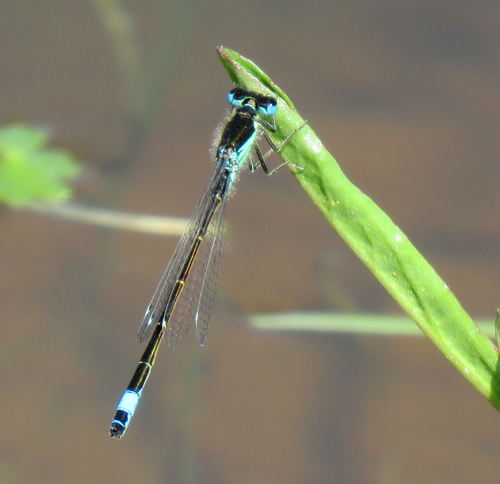 Note the blue underside to the eye. 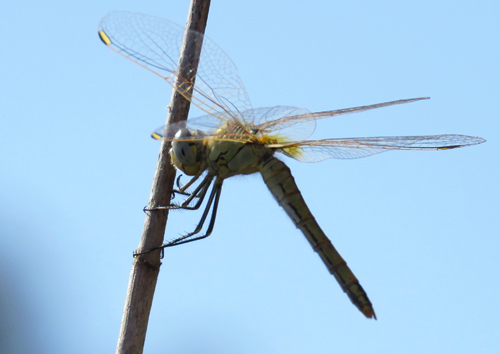 This species ranges as far as Africa and South-West Asia. 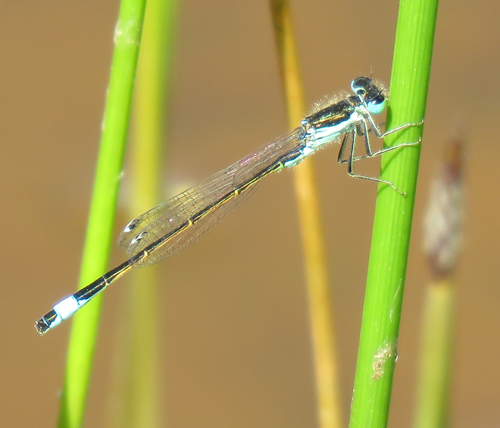 Female. 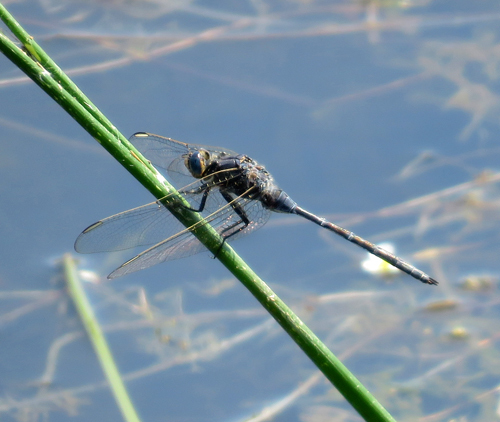 Male. 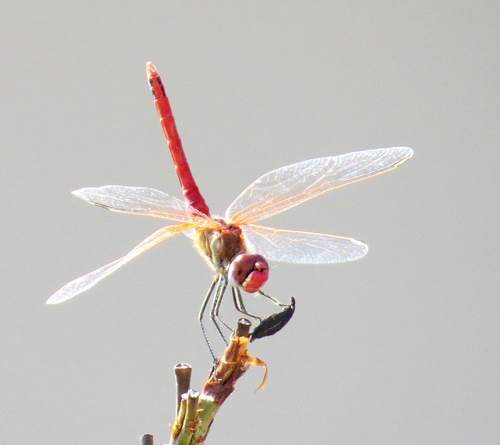 Showing red wing veins. 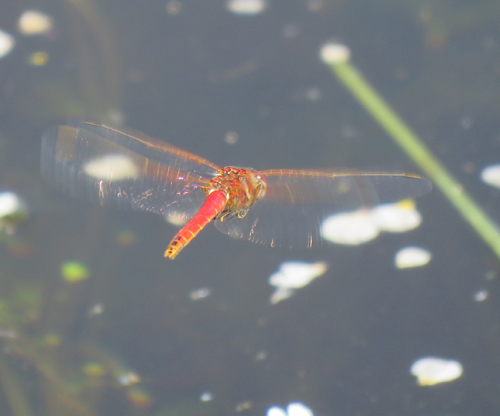 Male hovering over Windmill Pond. 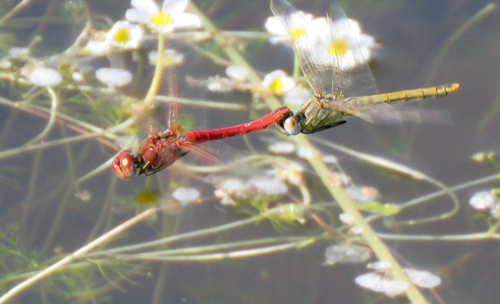 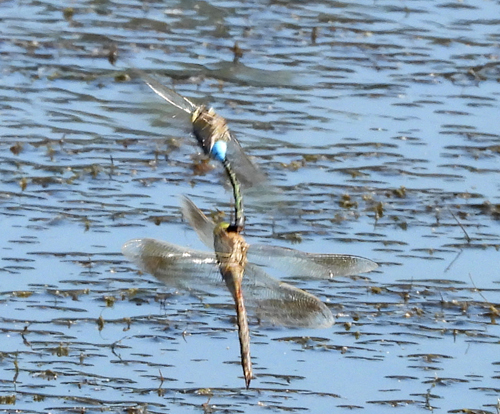 Mating while in flight over Windmill Pond. 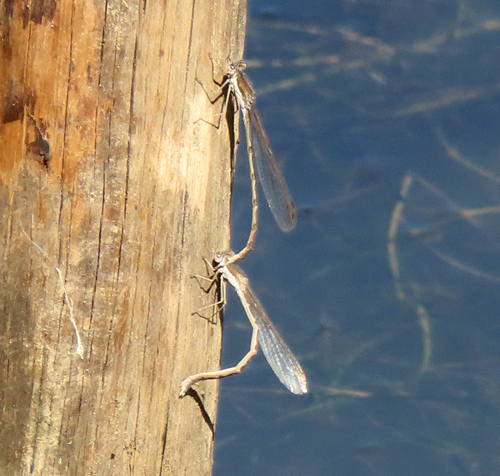 Ovipositing (egg-laying) while flying over Windmill Pond. 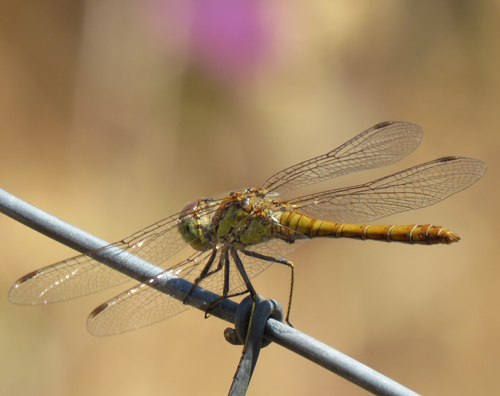 This species is found throughout Portugal. 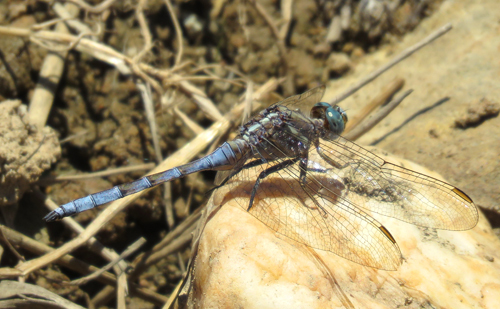 Female. 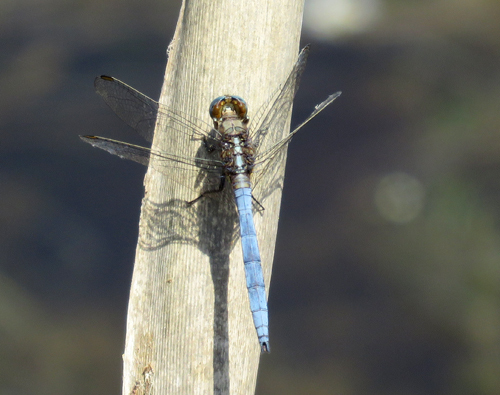 Male. 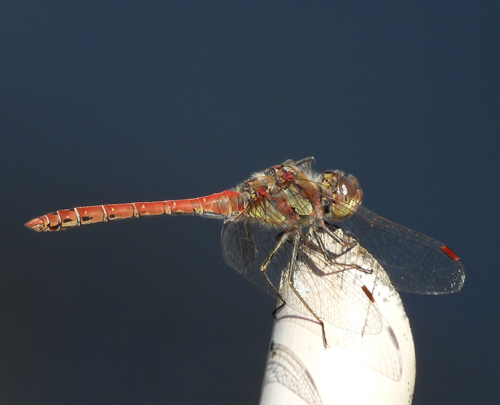 Showing orange basal suffusion and red veins. 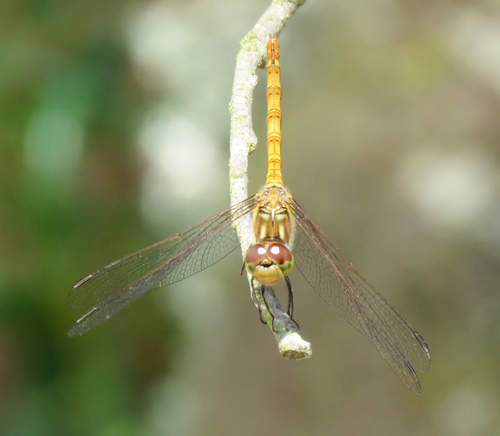 Female perched on Iberian Holm Oak branch - well away from any standing water. 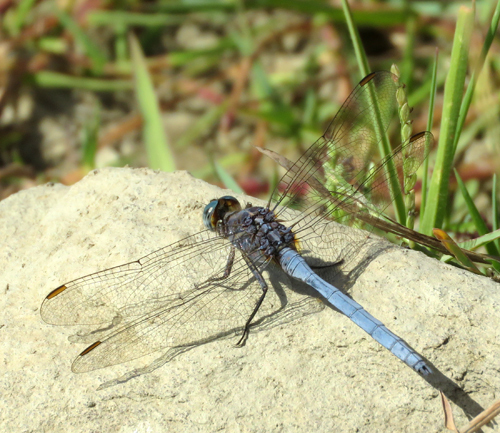 Male. 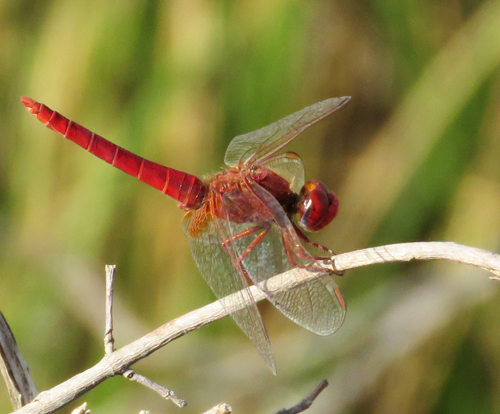 Note Red Pterostigmas and lack of basal suffusion on wings.